Refer to DTCs C1405 and C1406 (See page ). (a) Using the Techstream, check for any momentary interruption in the wire harness and connector corresponding to the DTC (See page ). (g) Check that there is no difference between the speed value output from the speed sensor displayed on the Techstream and the speed value displayed on the speedometer when driving the vehicle. Factors that affect the indicated vehicle speed include tire size, tire inflation and tire wear. The speed indicated on the speedometer has an allowable margin of error. This can be tested using a speedometer tester (calibrated chassis dynamometer). For details about testing and the margin of error, see the reference chart (See page ). The speed value output from the speed sensor displayed on the Techstream is the same as the actual vehicle speed measured using a speedometer tester (calibrated chassis dynamometer). (b) Check the speed sensor installation (See page ). There is no clearance between the sensor and the front steering knuckle. (a) Remove the front speed sensor (See page ). If no damage to the speed sensor tip is found during this inspection, do not replace the speed sensor. If there is iron powder sticking to the rotor, this will result in a malfunction, so confirm that the rotor is not contaminated with foreign material before replacing the sensor. (a) Remove the front axle hub inner bearing (See page ). 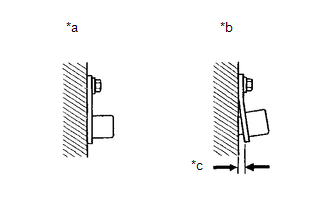 (b) Check the front skid control rotor. No scratches, oil, or foreign matter on the rotors. The front skid control rotor is incorporated into the front axle hub inner bearing. If the skid control rotor needs to be replaced, replace it together with the front axle hub inner bearing. (c) Reinstall the front speed sensor and the front axle hub inner bearing. (a) Remove the skid control sensor wire. 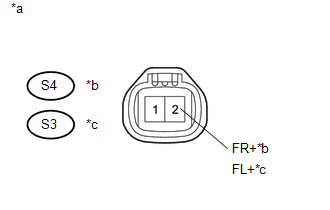 (c) Disconnect the S1 skid control ECU (brake actuator assembly) connector and the A8 and/or A9 front speed sensor connector.